Three Nepali women climbers on 26 July became the first all-women team to climb K2. 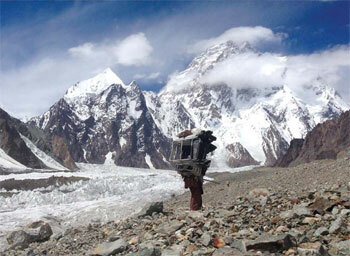 THE MOUNTAIN IS YOUNG: A porter carrying goods with clouds on the summit of K2 last month. Three Nepali women climbers on 26 July became the first all-women team to climb K2, which at 8,611m is the second highest mountain in the world. Maya Sherpa, Dawa Yangzum Sherpa and Pasang Lhamu Sherpa are part of the K2 Women Climbing for Climate Change Expedition and summited a peak that is regarded as much more difficult than Mt Everest. The mountain, which is on the Pakistan-China border has killed one in every four people trying to climb it. Of the 86 who have died on the mountain in the past 80 years, six are Nepalis. “We are finally at the base camp after successfully summiting K2. We are grateful to everybody who supported this project, especially our family members for being with us every step of the way,” wrote Pasang Lhamu on the K2 expedition website. The team returns to Kathmandu in mid-August. Maya Sherpa, Dawa Yangzum Sherpa and Pasang Lhamu Sherpa (above) in a tent at Camp 4 after summiting this week. View from Camp 2 of the Godwin-Austen glacier (left). The expedition was designed to raise international awareness about the impact of climate change on the Himalaya and was supported by the Himalayan Women Welfare Society, Kathmandu-based ICIMOD, Sherpa Adventure Gear, Nepal Mountaineering Association, Trekking Agencies Association of Nepal and Cho-Oyu Expeditions among others. This year marks the 60th anniversary of the first ascent of K2 by an Italian expedition led by Ardito Desio on 31 July, 1954. Nearly 350 people have climbed the mountain, and only seven of them were women till the Nepalis brought that total to 10. Of the 7 women who have climbed K2, 4 of them died on the mountain and 1 of them died subsequently while climbing Kanchenjunga. Some 84 have been killed on the mountain, and K2 is second only to Annapurna I in the fatality rate among Himalayan peaks. Two Nepali guides, Chhiring Dorje Sherpa and Pasang Lama were involved in a dramatic rescue on K2 and are the subject of the book, Buried in the Sky by Peter Zuckerman and Amanda Pandoan about the death in 2008 of 11 climbers on the mountain. Following their successful ascent of K2, the team is planning to climb Mt Kanchenjunga, the world’s third highest mountain.